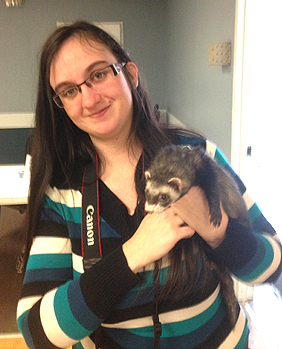 Jessica Lough of the Ferret Rescue Society of Ottawa (FRSO), with her ferret named Nacho, official “spokesferret” for FerretFest. Nacho “lives to cuddle.” Photo and story by Claudine Wilson. Several days a week, Jessica Lough makes her way to work at the Westboro Legion upstairs bar, but on Saturday April 12, she headed there for another reason: to help with FerretFest 2014. As a board member of the Ferret Rescue Society of Ottawa (FRSO), Jessica and other volunteers welcomed ferrets, their owners and numerous fans to an afternoon of ferret fun with bowling, sheep tipping, tube races, and a great bag escape. Between competitions, many of the critters goofed around in the play zone, much to the delight of children and adults alike. Kitchissippi resident Maia Cody was on hand to support her colleague, and to share in some of the fun. Nacho, one of Loughs’s two pet ferrets, was the official “spokesferret” for the event. Once it was over, he resumed his duties tweeting for FRSO @FerretRescueOtt. Participants enjoyed meeting up with old and new ferret friends and their human companions. Many also were eager to spread the word about the joys of owning these “goofy” pets. FerretFest 2014 attracted 97 human and 35 ferret guests, and raised $1,500 to help Ottawa’s only ferret rescue group find safe haven for unwanted, abused, and abandoned ferrets. For more information about Ferret Rescue Society of Ottawa go to ferretrescue.ca.